One reader of my previous post (on how Art Tatum explains the genius of tiki-taka) asked about why I didn’t discuss Barcelona’s 7-0 aggregate loss to Bayern Munich in the Champions League last year, a loss that capped a sense of Barcelona’s wane as the dominant team in club football. One reason is that I initially developed the idea before those games were played, when I didn’t yet have a blog to post it on. But another is that the best explanation of those games isn’t fully illuminated by analogy to Art Tatum, and so in this post I will only talk briefly about the “decline” of Barcelona in connection to Art Tatum before shifting to some more conventional analysis of Barcelona, both against Bayern Munich at the end of last season and against Atlético Madrid in the Supercopa this season. It’s a long one, so just read the sections that interest you. Part of the difficulty in thinking about how Art Tatum can help us to understand the decline of Barcelona is that Tatum never really did decline. His extensive solo recordings for Granz in the final years of his life are technically the equal of his earlier commercial sides, and because Granz recorded him for long-playing format rather than for singles, some feel (not unreasonably) that these late recordings give Tatum the space to spread out on record as he did in live performance. As such, there is no real decline in Tatum’s output to compare with the disappointing end to Barcelona’s 2012-13 season. The one criticism that might be leveled at these solo recordings, though, is possibly relevant to Barcelona as well. Though Tatum’s later recordings often give him more space than earlier recordings for single release, Tatum’s solos on these late recordings of standards often replicate those he had previously performed almost note-for-note. In a way, this suggests that Tatum’s performances are better characterized as arrangements than as improvisations in the ordianary sense. But it might also suggest an increasing predictability of approach, a kind of routinization of genius. To the extent that this is a fair assessment of Tatum’s late solo recordings, we might seek a parallel in a growing staleness to Barcelona’s possession game. In their late season ties in the Champions League and domestically against Real Madrid, they did look a shadow of the team that had dominated European competition. And yet, their statistical dominance in games quite often failed to reflect the difference. Consider Xavi’s performances in two critical games where he seemed, to the eye, a largely ineffectual player. In Barcelona’s narrow 2nd leg “victory” over Paris St. Germain (on away goals), Xavi recorded a perfect passing game, while against Bayern Munich in the following round his numbers were only marginally less impressive. (Xavi’s significant reduction in passes attempted in the second tie, completing 49 of 51, mostly reflects his substitution at the 55th minute. Averaging the same productivity over 90′ would have yielded a very comparable 80 of 83.) The numbers portray an undiminished technical achievement; but viewed from the stands, that technical excellence failed to captivate, and on the field to translate into substantive result. In fact, one of the key elements of Pep Guardiola’s coaching style, as Jonathan Wilson has emphasized (more than once), was a constant impetus to innovation designed to overcome Bela Guttman’s Three-Year Rule and stave off complacency–or the routinization of genius. As with Tatum, I think it’s dangerous to read too much of a decline into that apparent lack of “creativity” or, more justly, of cutting edge. It’s worth remembering that the same team also won the league with 100 points and a +75 goal differential. Even critics predicting a Barcelona loss were surprised by the comprehensive nature of their defeat; and a loss to a team putting together one of the most dominant single seasons in European history is hardly proof of decline–at least, most critics have not attached the same long-term significance to Borussia Dortmund’s (admittedly, less overwhelming) losses to Bayern. On the other hand, Barcelona’s loss to Bayern Munich followed a series of unconvincing performances in the Champions League (and, to a lesser extent, domestically). They dropped an away game in the group stage against Celtic, struggled in their away tie against AC Milan, and in both quarterfinal legs against Paris Saint-Germain. During the same stretch they lost to Real Madrid twice in a week’s time. Though far enough ahead in the league table to avoid any serious domestic worries, Barcelona’s losses to Bayern Munich capped what was unquestionably a wobbly spell by their elite standards. The interesting question at the start of this new season, in my view, is to ask how much of this wobble was created by avoidable or correctable factors and which seem likely to continue to plague the squad as they enter a potentially new era under Gerardo “Tata” Martino. So what did lead to Barcelona’s loss? Fatigue and injury were key factors late in the season. Carles Puyol has had serious injury problems for the second time in three seasons, and did not play in the tie. His absence and Pique’s apparent fatigue greatly contributed to Barcelona’s vulnerability to counter-attack in their final three rounds of the Champions league. With Xavi’s performance, fatigue and aging once again seem likely culprits. Whether the result of an underlying injury or a bad tactical decision (either by Vilanova or Messi himself), there can be no question that Vilanova was the one who failed to make the needed change in the 1st leg against Bayern. Messi was again ineffectual, and probably should have come off at halftime, when Barcelona were only a goal down. Given the quality of Bayern’s play, it’s not clear that a change could have saved the game, let alone the tie; but something needed to be done, and Tito was unwilling to take the chance. He effectively admitted his mistake in removing Messi from the starting XI in the 2nd leg, but by that time it was too late to save the day and at any rate Barcelona were further handicapped by other injuries and suspensions, most notably to Busquets, requiring the inclusion of Alex Song in the holding role. With all due respect to Song’s considerable talents, he was never up to fulfilling the roles that Barcelona asked of him, and Bayern happily closed down everyone else in the midfield, confident–with good reason, as it turned out–that a pass to Song was effectively a turnover. Eventually, Xavi had to sacrifice his more advanced role to play alongside Song in order to ensure a pass was available that even he could complete. Ironically, the closest thing to a bright light in that game for Barcelona was David Villa’s role as a target man cutting in from the right and eventually up top after Fabregas retreated permanently into the midfield following the 55′ substitution of Alexis Sanchez for Xavi. One couldn’t help but wonder if he might have been introduced prior to the 83rd minute in the previous leg. One last point that bears mentioning before turning to Tata Martino’s Barcelona and the Spanish Supercopa is Michael Cox’s suggestion that, despite being a fine technical display, Bayern’s defeat of Barcelona took advantage of the same three weaknesses that all of their opponents have sought to exploit: lack of physicality, lack of height (in set pieces), and lack of width (on the counter-attack). While there is more than a little truth to this claim, particularly in specifically accounting for Bayern’s goals, I don’t think it does justice to the style and substance of Bayern’s attack. While it is true that they muscled Barcelona out of the midfield, they also frequently began their attacks with Barceona-esque short and intricate passing from out of the back. Though Bayern had nothing like Barcelona’s possession in either game, they are one of the very few teams who seemed capable of passing in and around them, and that approach distinguished them from previous competitors. So how much of last year’s difficulties seem relevant to Tata Martino’s Barcelona this year? On the basis of the two-legged Spanish Supercopa against Atlético Madrid, quite a few of them. Diego Simeone’s team remains very strong despite the loss of Radamel Falcao and should be an exciting addition to the Champions League this year, but Barcelona will still feel a win on away goals is not a convincing victory. After his stunning 3′ goal in the 1st leg, it looks like David Villa still has a lot to offer in attack, though of course now it will be for Atlético rather than Barcelona. The Catalans’ defense also remains worryingly suspect, as Arda Turan and Diego Costa looked constant threats on the counterattack. Atlético’s approach to stopping Barcelona was a conventional tight and disciplined two lines playing deep, but they executed well and proved difficult to break down. Barcelona also still looks vulnerable to a highly physical team, though in this respect Barcelona may take comfort from their ability to maintain focus, particularly in a second leg that in the latter stages looked more like a series of MMA bouts. Perhaps the most worrying factor of all for Martino should be Lionel Messi’s health. It’s easy to forget that Barcelona’s dominance has accompanied a remarkable run of fitness for a player as regularly hacked and harried as Messi is. As at the end of last season, Messi looked unsettled in the first half of the opening leg and frequently dropped deeper. He was subbed at halftime with an aggravated thigh injury after being targeted by Godin, whose display over the two games was, as Sid Lowe noted on twitter, pretty shameful. He came back in the second leg, but again spent a lot of the game deep in the midfield. You have to credit Atlético’s team defense against Messi, especially in the 1st leg, where there was less vindictiveness and Arda Turan in particular played a vital marking role whenever Messi drifted right. Barcelona will be happy that they don’t have to face Atlético every week. Still, Messi looks like he would benefit from some management of playing time, and if Martino’s willingness to pull him at halftime was promising, his decision to start Messi in the second leg is by equal measure worrying. In fact, my guess is that willingness to manage Messi’s and Xavi’s game time in the first half of the season will be one of the keys to how Martino’s Barcelona perform in the latter stages. So far, the indications are mixed at best. It’s probably a positive indicator as well that Tata started Fabregas over Iniesta in the second leg. That would seem to be a step toward the ultimate transition from Xavi’s team to, if not Cesc’s team then at least to a team in which Cesc is the central creative force in midfield. The other really promising thing to take away from the Supercopa was Neymar’s potential impact on the team. His tying goal in the first leg was a strikingly untraditional Barcelona goal, a long cross for a far post header. It offers hope that Neymar can do what none of Barcelona’s recent star transfers have been able to: to provide an effective plan B for the team. If Martino can integrate Neymar into the team without quashing his distinctive traits, Barcelona could become a more diverse attacking threat. And that is a truly terrifying thought. Moreover, if Neymar’s quick and efficient dribbling game can be integrated into Barcelona’s overall offense, it might create chances for Alexis Sanchez’s slower and more self-indulgent dribbling to also contribute positively, especially if Sanchez can learn to adapt some of his younger teammate’s decision-making and passing awareness to his own game. 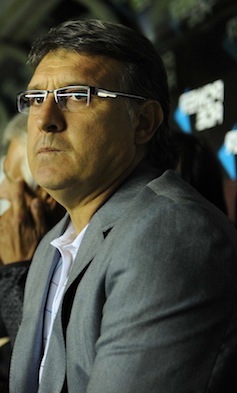 Finally, there is simply the fact that Tata Martino will be present on the touchline and in training. Tito Vilanova is clearly not responsible for his absences last year, nor can Jordi Roura really be blamed for not being up to a job he never applied for and clearly did not relish. But if last year’s late season dip suggests anything, it is that even great teams do not, in fact, coach themselves. It remains to be seen whether Martino’s return to energetic pressing high up the pitch will prove a self-defeating tactic as the season wears on, but his ability to return the team to their previous strengths at least suggests that has the dressing room early. Given the challenges facing him, that seems a vital starting point.